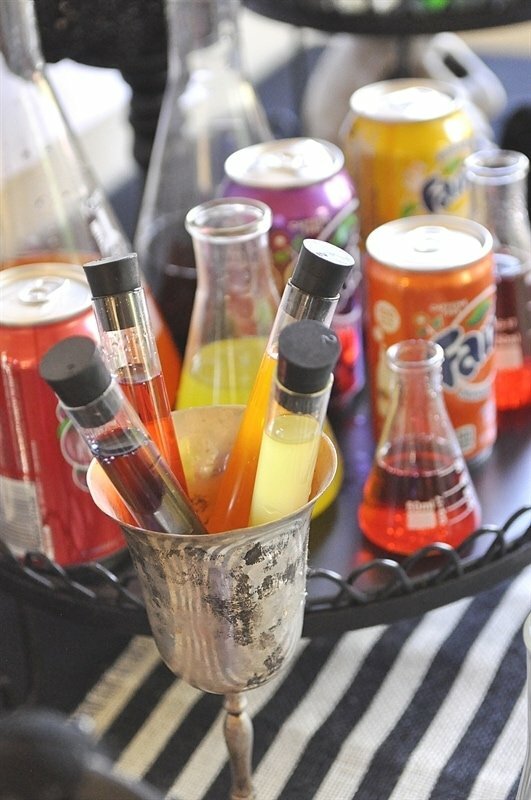 This Mad Scientist Soda Laboratory is a super fun Halloween Party Idea the kids will love it. I love Halloween. In fact I think I love it more now that my kids are grown and gone from home than I did when they were little. I look forward every year to hosting a Halloween party and inviting all my neighbor kids. 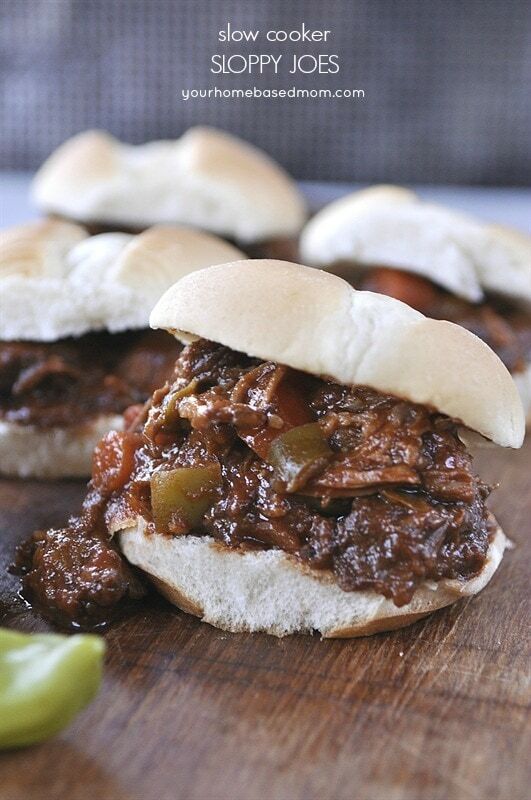 Each year I look for some new fun twist to add to the party. I love to include some kind of hands on activity where they can get involved. These Candy Skewers were a big hit one year and the Decorate your Own Donut party was a big hit as well as my I Scream You Scream Witch Party last year. Sometimes I think I just have way too much fun! This year I am so excited to partner with Coca-Cola and Nabisco on their Spooky Snack Lab Halloween Campaign #SpookySnackLab. 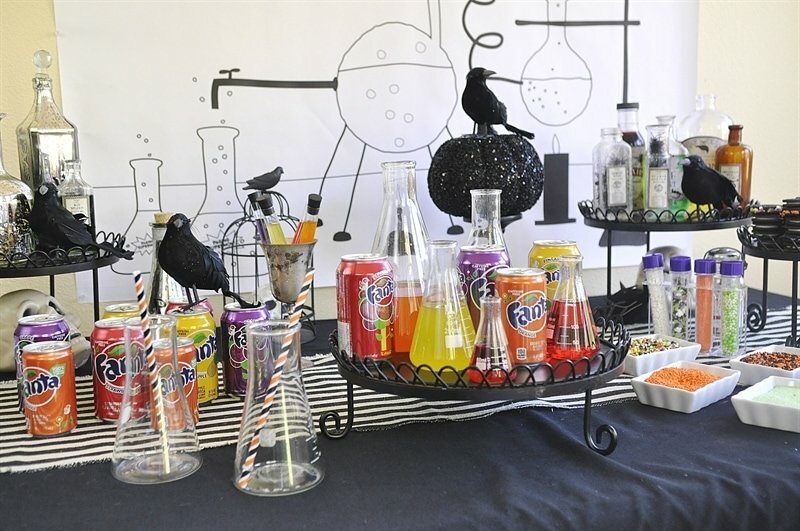 I put together a fun Mad Scientist Soda Laboratory featuring Fanta Soda (a favorite at our house) and a decorate your own Oreo station. 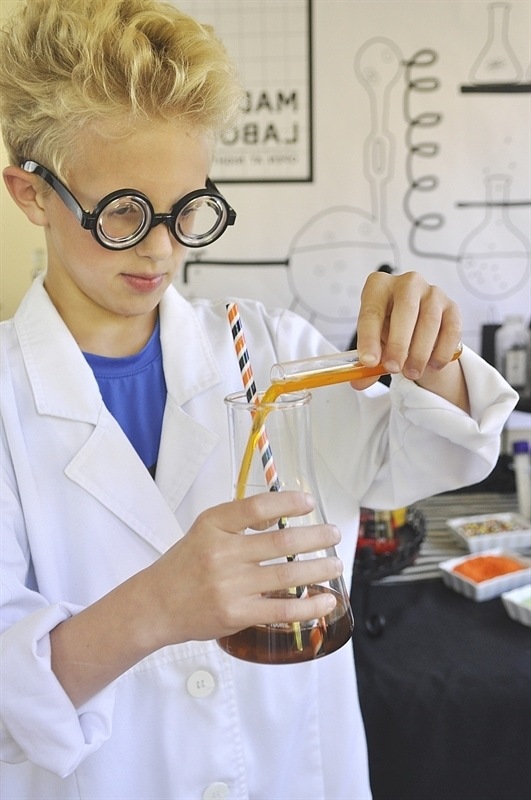 What kid doesn’t love to pretend they are a mad scientist?? 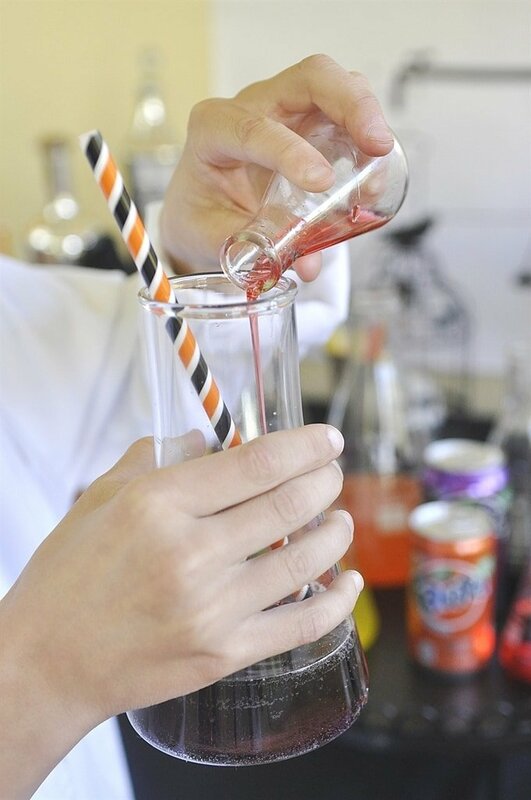 I used some glass science beakers and filled them with all the fun flavors of Fanta soda – orange, grape, pineapple and strawberry and let the kids mix and match their soda flavors to their hearts content! I put some of the soda into little glass test tubes too. I think I may have had a little too much fun with this party idea! Thanks to Thomas, my mad scientist for the day! 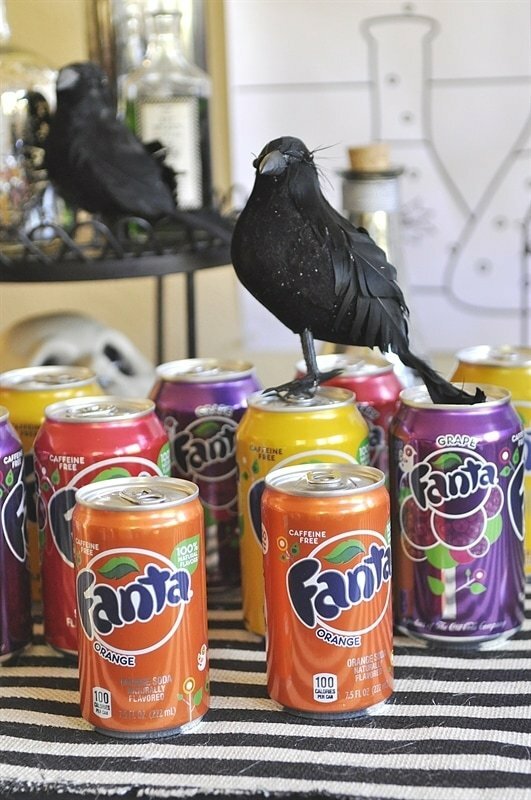 Lucky for me he loves soda and told me Fanta was his favorite! 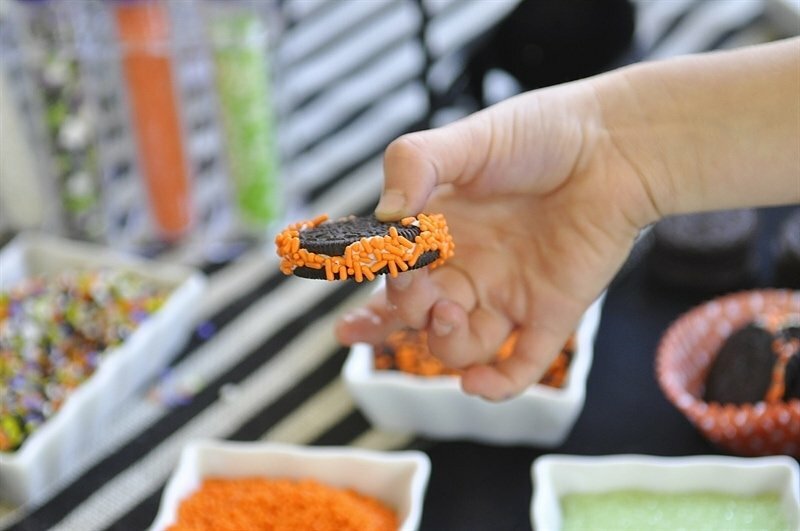 For another fun hands on activity we set up a decorate your own Oreo station. This was a fun and easy activity for my cute little witch. 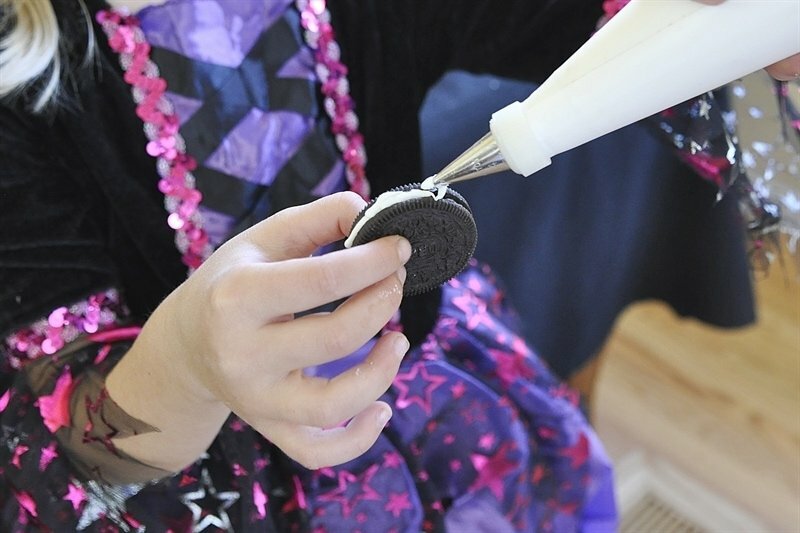 Younger kids may need a little help from mom getting their frosting around the edges of their Oreo. I bought some cream cheese frosting from the store (you could make your own) and put it in a decorating bag with a small round tip. Just squeeze the frosting around the edge of the cookie. Don’t worry if you make a bit of a mess, it just means more sprinkles will stick! 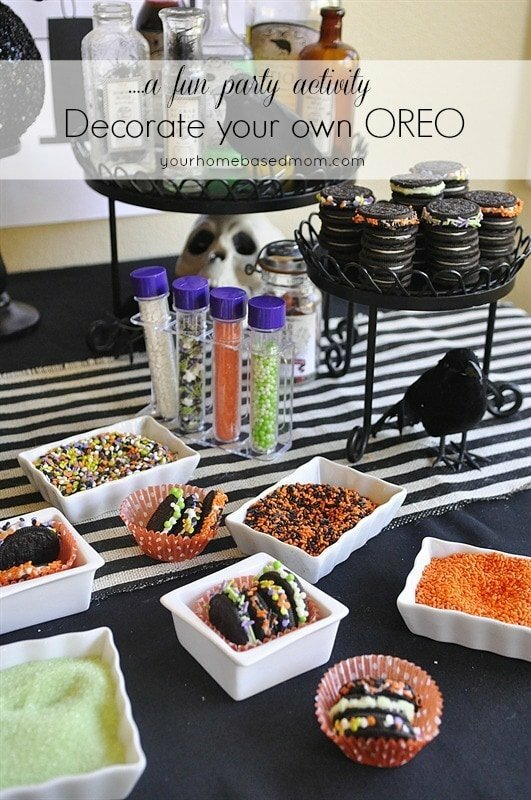 I had a fun selection of Halloween themed sprinkles for them to roll their Oreo into. The kids loved decorating the cookies but I think they liked eating them more! 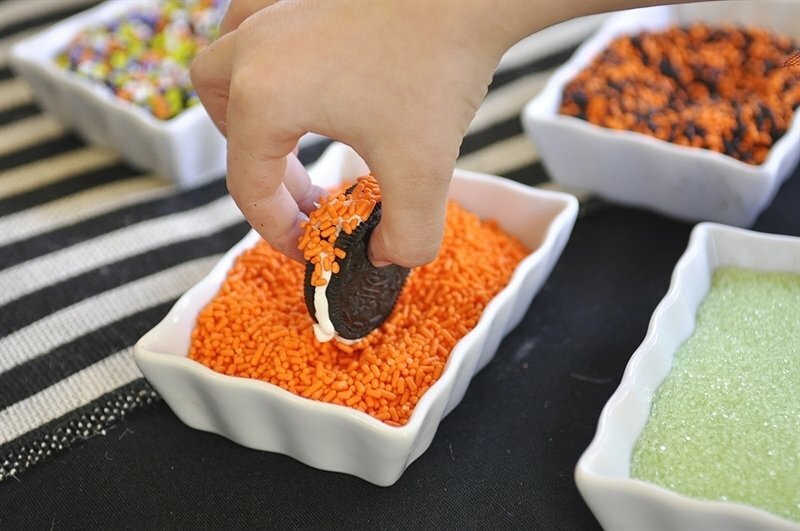 For more fun Spooky Snack Lab ideas be sure and check out all the amazingly creative people by visiting the Fanta and OREO Spooky Snack Lab board on Nabisco’s Pinterest Page! You can also get the latest spooky creations by following the hashtag #SpookySnackLab. Now for the real fun – a giveaway!! 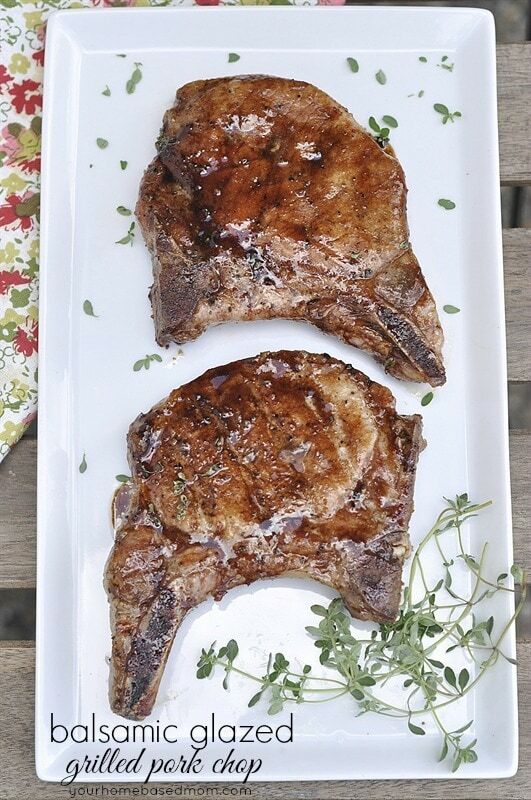 All you have to do is create a custom Pinterest Board with all your favorite Halloween recipes, lfiestyle and entertainment tips and tricks. Please be sure and to pin a few ideas from this post too. Leave me a link to your Pinterest Board in the comments to be entered to win. 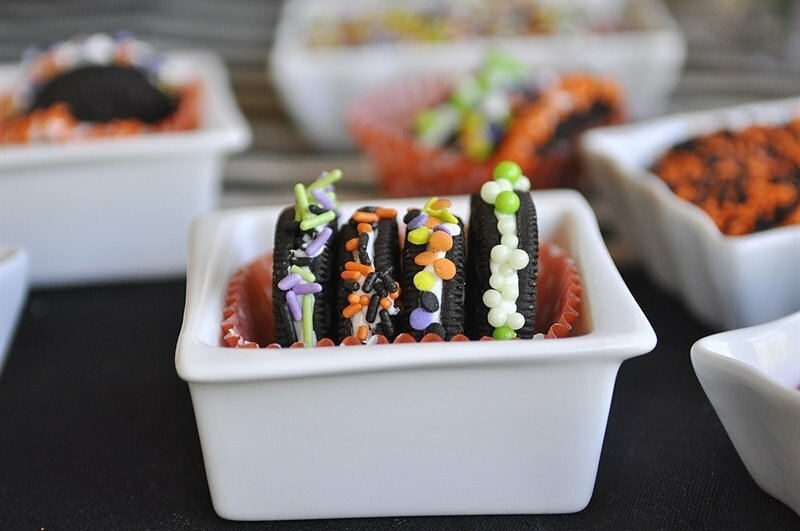 You can check out my fun #SpookySnackLabContest Pinterest Board here. I can’t wait to see what you pin to your board! A $500 gift card ($550 Approximate Retail Value). 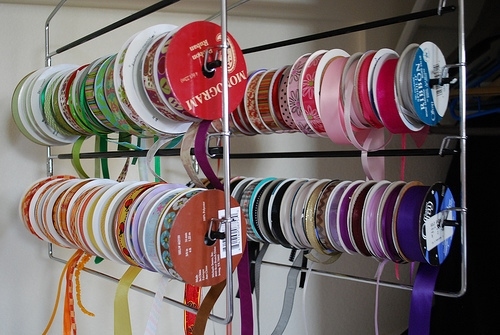 Check out this fun video – love this idea!! This is a sponsored post written by me on behalf of Coca-Cola for Nabisco. All opinions are 100% mine. This is DARLING! I love every detail. Can’t wait to do this with my kids. My Halloween Pinterest board is https://www.pinterest.com/aksandy/halloween/. The backdrop was the perfect addition to the party! Another great idea for a Halloween celebration. This looks perfect for my Activity Days girls! This looks like such a fun party! We LOVE Halloween in this house! I love your party style! Such a wonderful idea! I LOVE Halloween! I am definitely going to have to do it for my grandchildren. 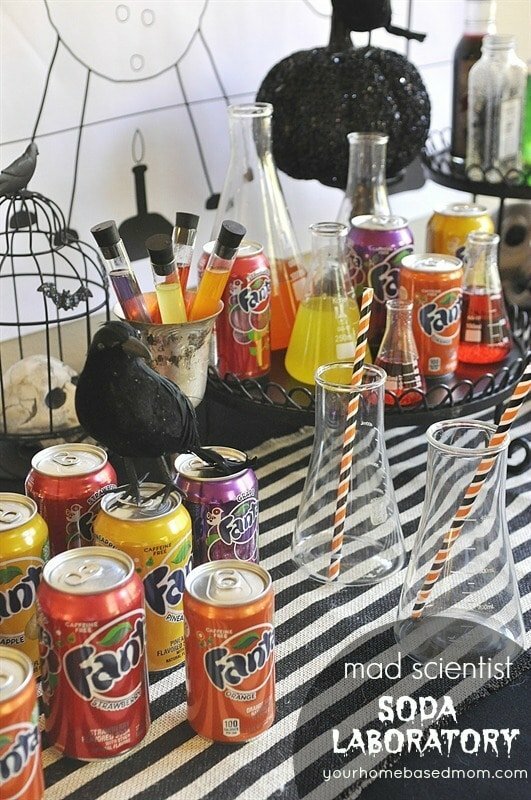 I just love this idea of a mad scientist party! These ideas are great! We are going to celebrate my baby’s first birthday on Halloween since she was born on the 28th and Halloween is on a Saturday this year–woohoo! What fun ideas! 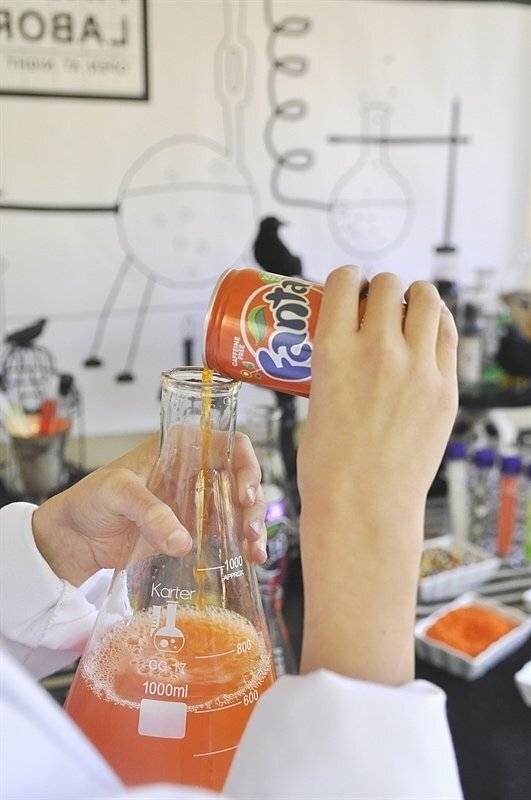 I pinned the mad scientist soda idea to my pinterest board. My daughters birthday is 3 days before Halloween and we are planning a big party this year. Perfect! I’m always on the lookout for Halloween party ideas for my son’s birthday. This is so cute and unique. Thank you for the chance and the fun contest! parties interesting. This is something I can use this year. Thanks for the ideas.